WHO was the DAVIS CUP named after ? You may not have recognized Spiderman in this photograph, but I doubt it. If such be the case, you wouldn't be totally wrong, as the model for this photo is a real life hero, a Mexican immigrant who risks his life everyday so as to earn enough money to support his family in Mexico. 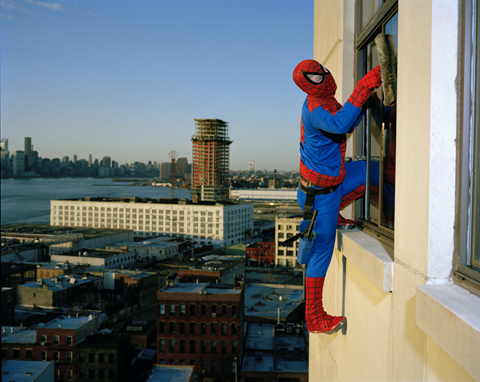 Someone has made an attempt for him to be hailed like a hero, she's the photographer DULCE PINZON in a project she has entitled THE REAL STORY OF THE SUPERHEROES. After September 11, the notion of the “hero” began to rear its head in the public consciousness more and more frequently. The notion served a necessity in a time of national and global crisis to acknowledge those who showed extraordinary courage or determination in the face of danger, sometimes even sacrificing their lives in an attempt to save others. However, in the whirlwind of journalism surrounding these deservedly front-page disasters and emergencies, it is easy to take for granted the heroes who sacrifice immeasurable life and labor in their day to day lives for the good of others, but do so in a somewhat less spectacular setting. This project consists of 20 color photographs of Mexican immigrants dressed in the costumes of popular American and Mexican superheroes. Each photo pictures the worker / superhero in their work environment, and is accompanied by a short text including the worker’s name and hometown in Mexico..